← Fudgy the Dinosaur cake!! Living in NYC the past few years, I’m not used to random acts of kindness from my neighbors. Hell, I never even knew WHO my neighbors were. It’s a total culture shock living in Long Island, now. So when I found out that my neighbor snow plowed our driveway without even telling us, I was overjoyed! To thank him, I made a plate of cookies. I’ve wanted to try a recipe from Cookies and Cups, a new blog I started following a few months back. I wanted something relatively simple since I didn’t have time to go shopping before the storm and wasn’t planning on baking. 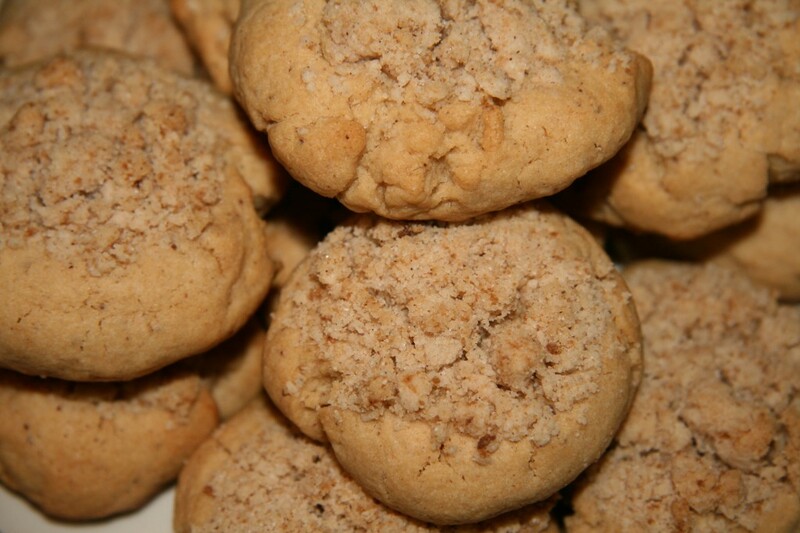 So I went with the coffee cake cookies, which looked like the perfect comfort food. 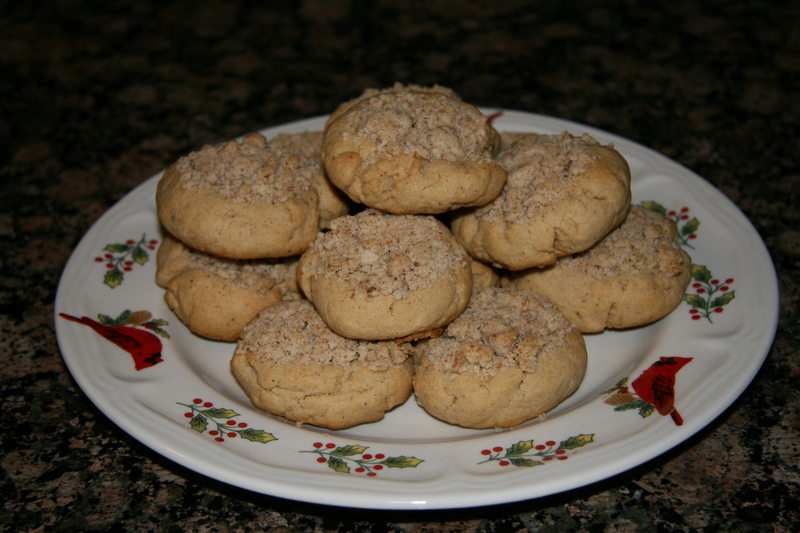 I call these “snowed in” cookies, because I had just enough ingredients to make them (literally). I had just enough brown sugar and not a drop more. As for cinnamon, I actually ran out of ground cinnamon and had to grind up a cinnamon stick using my Magic Bullet food processor. It actually worked really well, and the cinnamon smelled sooo fresh. I highly recommend it if you are making something with a lot of cinnamon, like cinnamon buns. I made my cookies the size of golf balls, and used a cookie scoop to make an indent in the cookie to fill with the crumb mixture. I put a lot in the indentation and then packed some more on top. I actually had quite a bit of crumble topping leftover, and now hubby is eating it over his ice cream. So if you have leftover topping, save it! ***Note, the original recipe calls for 10 TBSP butter and 1/3 cup shortening. Since I didn’t have shortening on hand, I used 2 sticks of butter and chilled the dough for 1 hour before baking to ensure the dough was stiff enough. I don’t know if the butter substitution affected the baking time, but I had to bake my cookies for 15 minutes before they were golden, compared to the 9-10 minutes in the original recipe. Just thought I would mention that in case you decide to go with shortening. Mix all the ingredients in a bowl. You can use a potato masher to get the mixture started. I found that mixing with my hands worked best, though. Refrigerate while you make the dough. Mix the butter and both sugars for 1-2 minutes on medium speed until smooth. Add the eggs, vanilla, and cinnamon and continue to mix. Turn the mixer to low and mix in the baking powder, salt, and flour until the dough comes together. 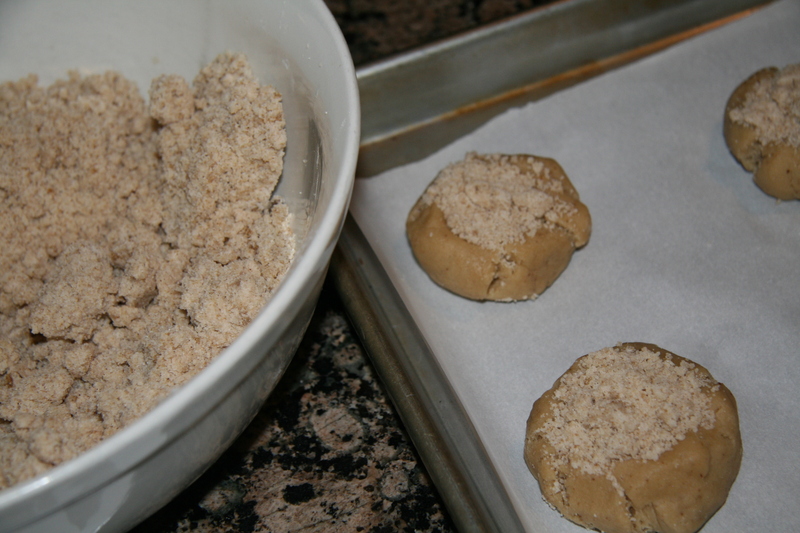 Chill the dough for an hour to prevent the cookies from spreading. 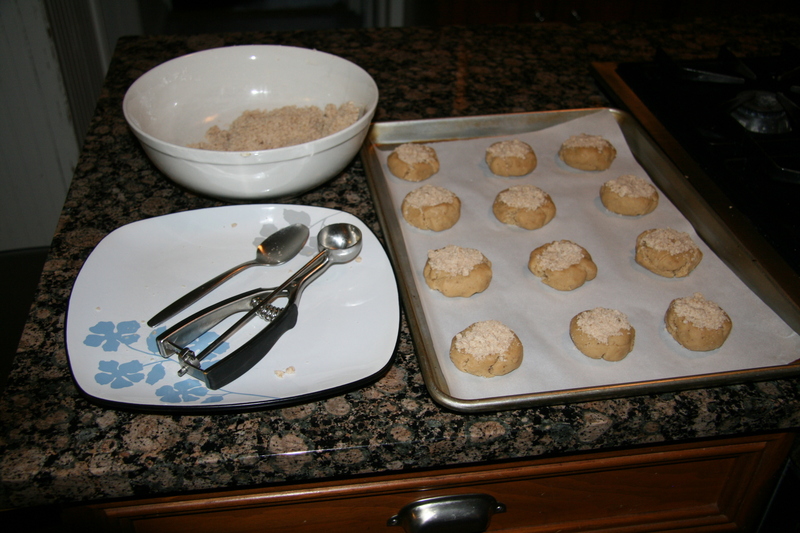 Use a cookie scoop or spoon to make a deep indentation in the center of each cookie. Fill with a generous amount of crumble topping and press down. 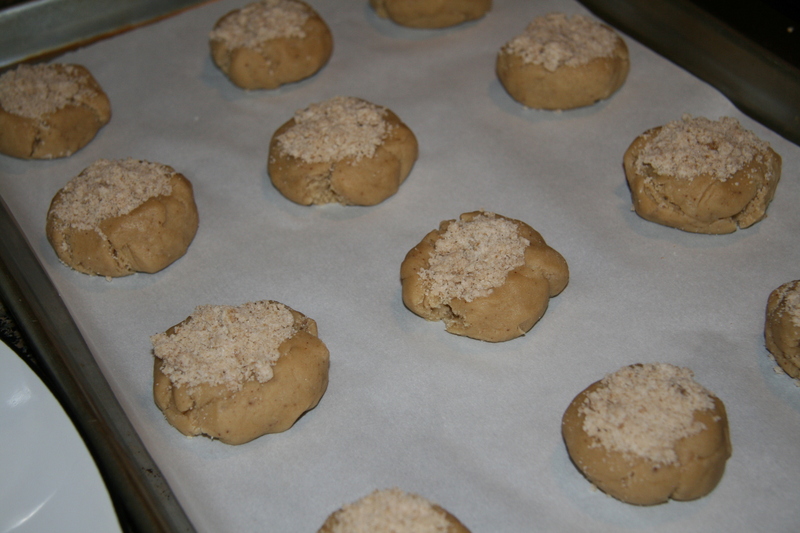 Bake the cookies for about 15 minutes, until the edges are golden. If you had a snowy day today, hope it was filled with yummy baked goods!